i b i k e l o n d o n: I'm voting with my bike, are you? I'm voting with my bike, are you? 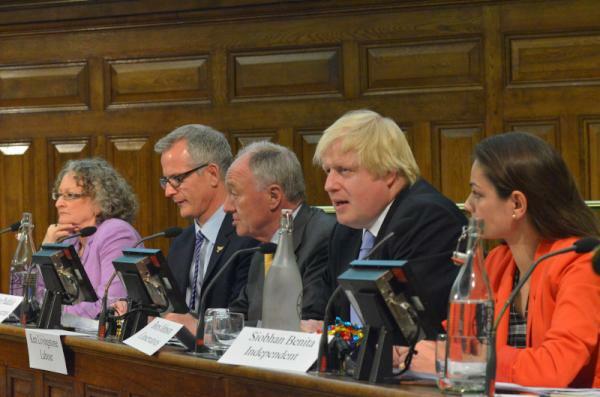 Cycling has never before been such a prominent election issue; yesterday all of the major Mayoral candidates debated cycle safety at a bike-specific hustings whilst over the weekend 10,000 people took to the rain-sodden roads to demand safer streets for cycling in London. 40,000 people have signed the Love London, Go Dutch petition whilst thousands have pledged specifically to "vote bike" and give their vote to the strongest candidate for cyclists. All of this takes places against the background of The Times and their ongoing Cities Fit For Cycling campaign. Suddenly, cycle safety is a big issue and in a tight run race there are a lot of votes up for grabs. Outside of cycling circles it is widely assumed that our current Mayor is the most obvious choice for people on bikes; Boris is known as the "cycling Mayor", London's public bike share scheme was delivered by him and is affectionately named after him. He has introduced four bright blue Cycle Superhighways - certainly not perfect cycling infrastructure but highly visual publicity material all the same. And he is often seen cycling around the city and has been cheerfully photographed skipping red lights. But his performance at the cycle safe hustings on Monday was a shambles. Arriving shortly after swearing at a BBC journalist on television, he proceeded to mumble incoherently whilst his opponents attacked him for his "smoothing the traffic flow" policies which have so often been the cause of cyclist's concern. Boris finished his performance by insulting cyclists everywhere by describing them as lycra-clad dreadlocked red light jumpers who are a danger to pedestrians. This is the man who got Barclays Bank to stump up readies for the bike hire scheme, who cajoled £15 million out of the Government for TfL's cycle safety review, who plans to extend the Boris Bike scheme, expand the Cycle Superhighways programme and has signed up to the Love London, Go Dutch key principals. But here, instead, was a man with his head in his hands, being jeered by the crowd, who seemed ill-briefed and scarcely able to believe that cyclists might want something else, something more solid; more commitments to a safer city for cycling for all abilities instead of a motor-saturated city space in which cyclists must "keep their wits about them" in order to survive the most dangerous areas. Polls are notoriously untrustworthy, especially in a small election like that of our city. Some currently show Boris ahead whilst others still show Ken taking the lead - with points so tight it would only take 10 or 20 thousand votes to swing it. Jenny Jones of the Green Party and Brian Paddick of the Liberal Democrats have been all over the cycling issues in recent months and have been fighting for every vote - it's good to know that they "get" the issues, and Jenny is especially highly regarded in cycling circles. They'll be scooping people's votes based on their performance, but it will be their second votes which swing the election - whoever is marked second on the ballot paper of people who vote for these two will win it. It is not too late for all of the candidates to renew their promise to cyclists and to offer us more. Many of us have encouraged friends and family to start cycling in the city and want to see London succeed as a people-friendly place where people can feel safe cycling. At the same time we have protested on Blackfriars Bridge, or joined the Tour du Danger. For me, I truly believe that transport is the ONE issue that the Mayor truly controls. They have influence on housing and finance and education but head up Transport for London and are directly responsible for what the city does - or does not do - for people on bikes. I love riding my bike but too often I feel in danger on our roads - whether that be at the hands of reckless drivers or exposed on dangerous streets - and I want our politicians to do something about this. I've signed up with Londoners on Bikes to vote with my bike this week and I'm hoping for further promises from our candidates - will you? For more analysis of the election and Saturday's Big Ride with me, Jack Thurston and Jen Kerrison listen again last night's The Bike Show. If you're still undecided who to vote for, watch this superb analysis of the cycling hustings by BBC London transport correspondent Tom Edwards.